Air Seismic. An innovative approach of seismic processing with excitation of vibrations in the air and focusing of vibrational energy in receiving points located on the boundary of acoustic and elastic media. Generation of seismic is on the most expensive parts of seismic prospecting. Especially under completed surrounding/. It is proposed to use shots in air and water media on remote distasted from the surface of solid he misplace with later focusing of energy on any point of solid surface preferably with pressure geophone to register time of acoustic arrivals. Model simulation has shown possible concentration of energy on small area less than four meters in diameter. Proposed technology promises high shortage of expenses and ecological advantages. 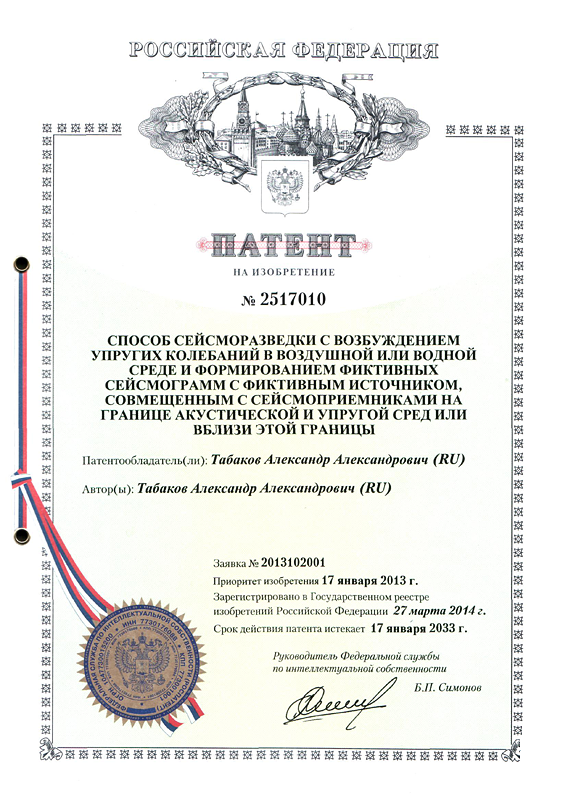 М.М.Popov, Doctor of Physical-Mathematical Sciences(St.-Petersburg Department of Steklov Institute of Mathematics RAS). A.V.Nikolaev, Senior Scientist Researcher of Schmidt Institute of Physics of the Earth of the Russian Academy of Sciences, corresponding member of the RAS. Response on the invention:#1, #2, #3, #4.